Let Us Introduce You to . 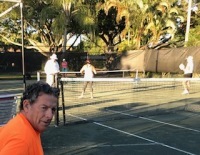 . .
Ron organized our first competitive play event by holding a women's beginner and intermediate tournament. 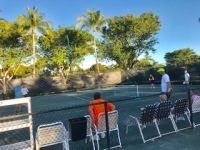 Mother nature wasn't cooperative and the early rounds of play had to endure high temperatures, wicked wind gusts and very dry courts. Regardless of conditions, the participants played hard and made it a fun afternoon. We will send out a notice when the Men's event will be scheduled. The Tuesday and Thursday clinics have been very well attended but there is always room for free play afterwards so don't let that full sign up sheet keep you from coming by and getting in a game. Now that so many of you have had an opportunity to learn the basics, its time to call a few friends, set up games and hone your skills. If you have any questions about the game or schedules please feel free to contact Steve Bodner at sbodner1@gmail.com or Ron Olesiak at ronref44@aol.com . 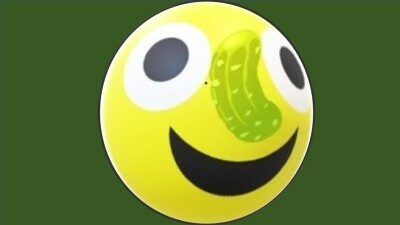 Pickleball was invented in 1965 in Washington state. It was named after the "pickle boat" which was the last boat to come back to shore after the catch and was comprised of the crew members who were the last to be chosen to work that day. Two years later, the inventor's dog was named Pickles, after the game was named. 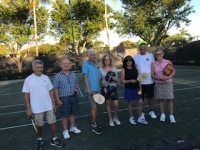 Pickleball is a paddle sport that combines elements of table tennis, badminton and tennis. The court is only 20' x 44' making this an exciting volleying game. Many games finish within 15 minutes. 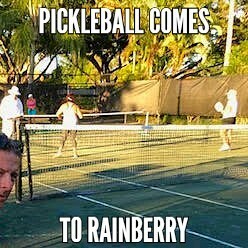 Rainberry has 4 pickleball courts on tennis court 11 (a.k.a., Pickleball Park). 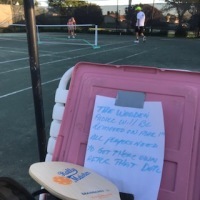 We are unique in that we figured out how to play on our softer surface (Har-Tru) vs hard asphalt courts that are being installed around us, for one-tenth the price. 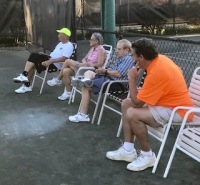 Our courts are less of an injury hazard than the hard courts and are easier to maintain. Have a GREAT DAY! See you on the courts. DO get to the kitchen line as soon as possible. 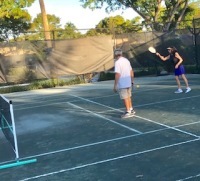 When you’re further back in the court, you will have to hit the ball higher and harder in order to get the pickleball back over the net. If your opponents are already at the net, two things are in their favor at this point in time. First, you’ll give them more court and more options for their returns. Secondly, you’ll be giving your opponents higher balls which are easier to put away. In short, stay close to the kitchen for more controlled, low, strategic shots. DO split step as you reach the kitchen line. The split step provides balance and will enable you to move in any direction your opponent’s shot might go. DO step into the kitchen to hit a ball that has bounced in the kitchen zone. This is the only time that you can actually hit a ball while in the kitchen. To complete this shot, you’ll have to step into the kitchen to reach any dink shot that your opponents hit back to you. Try your best to only take one step into the kitchen and reach for the ball in order to hit it back over the net. DO use your crosscourt dink, as the middle of the net is the lowest point. DO mix up your dink shots to keep your opponent on their toes. DO try to keep shots that are hit in the kitchen as low as you can over the net. You’ll want all returns that you hit from the kitchen to be as low as possible. This gives your opponents less chance to make the return. Avoid high, easy shots over the net. This type of return gives your opponents a better chance to strike and hit for the winning point. Now that you have a better understanding of what you can do in the kitchen, let’s talk about what you can’t​ do! For starters, it’s important to note that all of the don’ts will cause a fault and your team’s loss of a point. So, read this carefully because you don’t want to be that partner who loses the point! DON'T step into the kitchen with both feet. If a ball is to come to you in that stance, you will find it harder to hit it a controlled shot back over the net. DON'T let your follow through carry you into the kitchen after hitting a shot. Remain planted in this position to which you made contact with the pickleball. DON'T step on the kitchen line while hitting a ball out of the air. During match play it’s always important to get your bearings and know where you are on the court at all times. 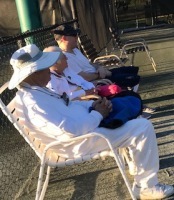 Tennis players are loving the game and the way the courts can coexist. Check out how many are playing and having a great new challenge.